when i sold my z1 8 months I kept the SM5 mount. is there anything i can add to it to make it fit or stable? don't really want to sell it or make it unused? I use SM-5 with Rode NTG-1 mic on EX-1 without any additions. I use the bigger diameter part of SM-5 to go into the EX-1 mic holder and I insert it into the mic holder from its back, so the mic sits on the camera more to the back. Go to the plumbing section of a local hardware store where they have "O" rings. You may find an O ring that fills the gap nicely. That's what I use on my NTG-1 in the EX1R. does anybody have pictures of there setup or examples? I reinforced my mic holder. However, I don't even use it anymore, and mount my mic with the hot shoe mount. I made my own, which also supports the on-camera light. I'll post photos if anyone's interested. Be warned: it's not pretty! yes that would be good. thinking of getting some o rings now. Not going to spend a lot of money getting a new rig for it. Here's the mic mount. It's Lightwave shock mount that's been screwed to a flat aluminum bar. That bar is attached to a hot shoe mount. Also attached to that is a rod and ball mount which is used to hold an on-camera light. This holds the mic further away from the lens and helps keep it out of the way of the camera light. The original Sony mic mount isn't used at all. 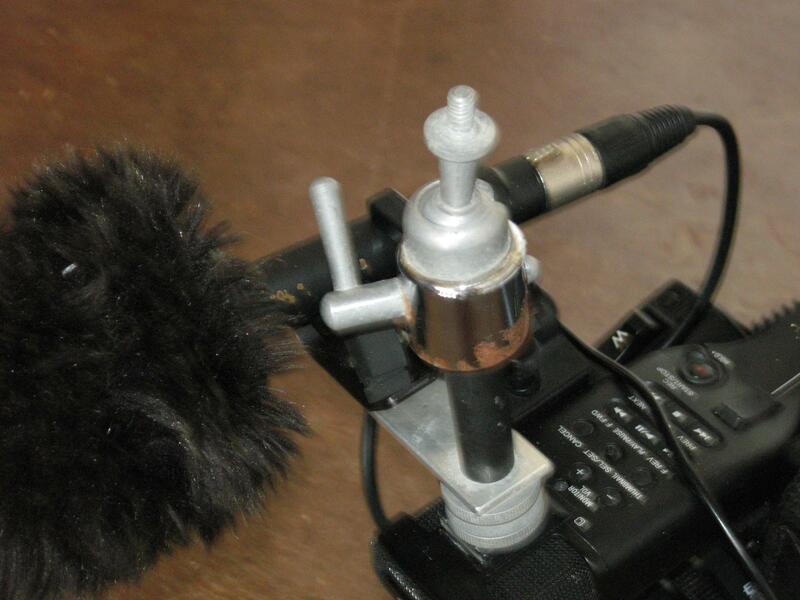 Elsewhere on this forum is how I reinforced the Sony mic mount to keep it from breaking.